The luxurious used BMW 7 Series is proof that the BMW knows how to create a stylish car. Even if you don't like the design, you've got to respect what the BMW can do. This is a sedan that's in its sixth generation, so it's had plenty of time to refine its capabilities. As a result, you receive a luxury used car that's great to drive. The downside? They're not cheap, with used prices that stay around £50,000. There's four-zone climate control, massage seats and several airbags. In certain models, you'll also get the marmite iDrive system, which you'll either love or hate. Newer models have updated versions of the system, so if you can afford them, go for those. You'll be happy with the engine, as BMW pride themselves on this area, but be careful with fuel consumption on powerful models. A larger engine also means larger insurance, so it's best to think long-term if finance is an issue. This car is a brilliant compromise between handling and incredible comfort. In our personal opinion, there are only a few cars that better it in this regard, and they cost more than £250,000. You might find that it's better to be a passenger, as the relaxation features trump almost every aspect. It's funny, that to truly experience all this car offers, you can't be behind the wheel. 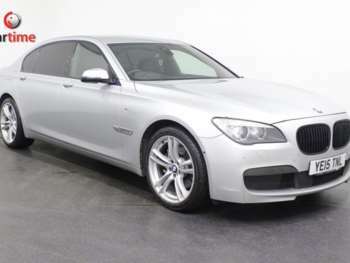 Got a specific BMW 7 Series model in mind?